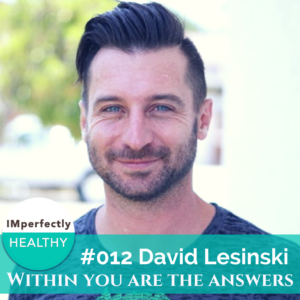 In this episode of IMperfectly Healthy, I interview David Lesinski, an emotional wellness coach, Ayurvedic practitioner and intuitive artist and poet. His passion for meditation, spirituality and energy medicine was developed through his own personal pursuit of finding stress relief and inner peace naturally, years ago. Dave assists his clients in releasing long-standing stress-patterns, feeling lighter/happier/empowered/renewed, and connecting with the deepest, divine part of themselves. explains how unresolved stress from the past gets stored in your body. takes you on a deep dive into what Ayurveda really is. walks you through the 5 layers of self. shares the benefits heart-based meditation can have on your health and happiness. gives you insight into what a powerful, creator you are. inspires you to do your work, trust your life and let your divine nature lead. Dave is an incredible example of what is possible for someone when you stay committed to your own personal growth path. He certainly walks his talk.